Nearly 500 players are taking part in the 2015 18 and Over USTA League Middle States Section Championships around the Mercer County area this weekend. This year’s event has drawn the top teams from across the section, including Pennsylvania, Delaware and New Jersey. The teams, which represent various clubs, parks, recreational departments and organizations, have finished at the top of their local leagues and are now vying for a chance to represent the USTA Middle States Section at the USTA League National Championships. The event will take place at Mercer County Park, Veteran’s Park and Community Park in New Jersey. Play in six divisions will begin Friday morning. Established in 1980, USTA League has grown from 13,000 participants in a few parts of the country in its first year, to more than 850,000 players across the nation today, making it the world’s largest recreational tennis program. The USTA League was established to provide adult recreational tennis players throughout the country with the opportunity to compete against players of similar ability levels. Players participate on teams in a league format, which is administered by the USTA through its 17 Sections. The league groups players by using six National Tennis Rating Program (NTRP) levels, ranging from 2.5 (entry) to 10.0 (advanced). USTA League is open to any USTA member 18 years of age or older. The USTA is organized geographically into 17 sections. The USTA Middle States section encompasses Pennsylvania, Delaware, New Jersey (exclusive of a 35-mile radius around New York City) and northwestern West Virginia. A volunteer-based, not-for-profit organization, USTA Middle States is dedicated to carrying out the goals of the national association within its region, particularly with respect to promoting tennis opportunities for juniors and adults of all abilities and cultural backgrounds..
For more information about USTA League, visit the Middle States website. 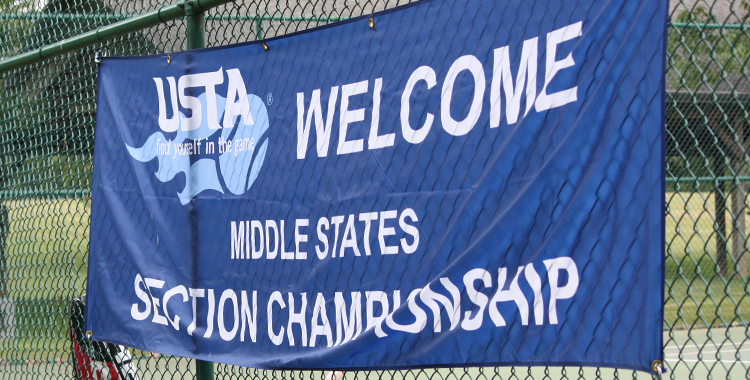 For more information, contact USTA Middle States Communications.